A testamentary trust is a legal estate-planning tool created under the terms of a last will and testament. 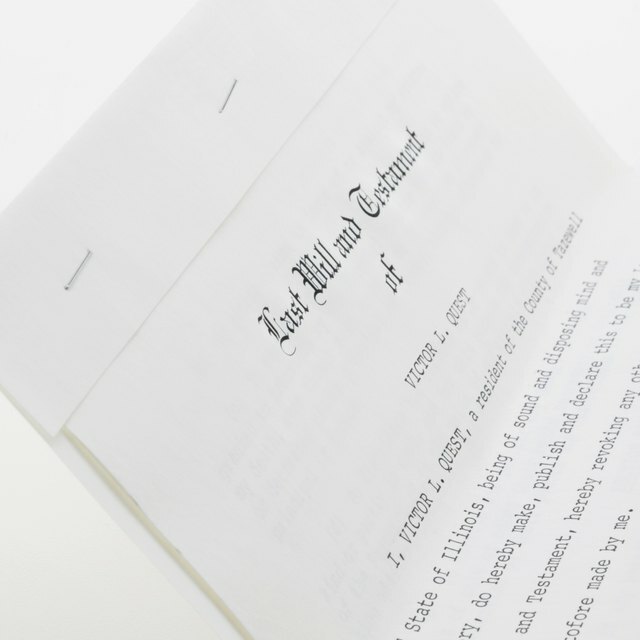 The deceased person transfers some or all of his property under his will to the testamentary trust, and the property remains in the trust according to the terms of the trust. A trustee manages the trust, and when the time comes, dissolves the trust. Review the trust agreement to identify the trustee and to identify any special conditions imposed on the dissolution of the trust. Each trust can contain its own specific instructions for how to dissolve that particular trust, and the trustee will need to follow any instructions. Transfer all property of the trust to the appropriate beneficiary designated under the trust agreement. As long as property remains in the trust, the trust will continue to exist and you cannot dissolve it. Notify all beneficiaries of the effective date of the trust termination. Providing notice to the beneficiaries gives the beneficiaries an opportunity to review the trust agreement and make sure that the trustee properly handles all distributions from the trust before dissolving the trust. Notify the holders of any insurance policies or financial accounts related to the trust of the effective date of the trust termination. For example, if a life insurance policy identifies the trust as a beneficiary, the life insurance company needs to be notified that the trust has been terminated. This is so the insurance company can obtain the information for a replacement beneficiary under the policy. Have the trustee sign a simple document describing the circumstances of the trust termination, such as when and why the termination occurred. Keep a clear written record of every action taken in connection with the dissolution and termination of the trust. Keep copies of all conveyance documents used to liquidate property from the trust, and retain a copy of the trust dissolution paper signed by the trustee. Also, keep a copy of all letters of notification to the beneficiaries, account holders, and other interested parties. Have a copy of the original trust agreement in the same file. A trustee who dissolves a trust without proper authorization, or in the wrong manner or at the wrong time, can face potential legal penalties for breach of fiduciary duties. If you are a trustee and you are uncertain whether you have authority to terminate the trust, or you are uncertain as to the proper procedure, consider consulting with a local estate planning attorney. You could be held personally responsible if you are found to have breached a fiduciary duty as trustee.